Google’s John Mueller posted in product forums that you don’t need to nofollow every link on your site, but you should focus on nofollowing links that point to a product, sales, or social media page as the result of an exchange. Now, on to the fun part of being an SEO: looking at a problem and trying to reverse-engineer Google’s intentions to decipher the implications this could have on our industry, clients, and strategy. The intent of this post is not to decry those opinions that this was specifically focused on bloggers who placed dofollow links on product/business reviews, but to present a few ideas to incite discussion as to the potential big-picture strategy that could be at play here. Penguin has repeatedly missed its “launch date,” which indicates that Google engineers don’t feel it’s accurate enough to release into the wild. The growth of negative SEO makes it even more difficult for Google to identify/penalize sites for tactics that are not implemented on their own websites. Do nothing. The penalty is specifically stated to “discount the trust in links on your site.” As a webmaster, do you really care if Google trusts the outbound links on your site or not? What about if the penalty does not impact your traffic, rankings, visibility, etc.? What incentive do you have to take any action? Even if you sell links, if the information is not publicly displayed, this does nothing to harm your link-selling business. Innocent site cleanup effort. A legitimate site that has not exchanged goods for links (or wants to pretend they haven’t) would simply go through their site and remove any links that they feel may have triggered the issue and then maybe file a bland reconsideration request stating as much. In scenario No. 1, Google wins because this helps further the fear, uncertainty, and doubt (FUD) campaigns around link development. It is suddenly impossible to know if a site’s outbound links have value because they may possibly have a penalty preventing them from passing value. So link building not only continues to carry the risk of creating a penalty on your site, but it suddenly becomes more obvious that you could exchange goods/money/services for a link that has no value despite its MozRank or any other external “ranking” metric. In scenarios No. 2 and No. 3, Google wins because they can monitor the links that have been nofollowed/removed and add potential link scheme violators to training data. In scenario No. 3, they may be able to procure evidence of sites participating in link schemes through admissions by webmasters who sold the links. If I were Google, I would really love to have a control group of known sites participating in link schemes to further develop my machine-learned algorithm for detecting link profile manipulation. I would take the unnatural outbound link data from scenario No. 3 above and run those sites as a data set against Penguin to attempt 100% confidence, knowing that all those sites definitely participated in link schemes. Then I would tweak Penguin with this training dataset and issue manual actions against the linked sites. This wouldn’t be the first time SEOs have predicted a Google subtext of leveraging webmasters and their data to help them further develop their algorithms for link penalties. In 2012, the SEO industry was skeptical regarding the use of the disavow tool and whether or not Google was crowdsourcing webmasters for their spam team. What objectives could the unnatural outbound links penalties accomplish? Spammy webmasters could continue selling links from their penalized sites, which would add to the confusion and devaluation of link markets. Webmasters could become afraid to buy/exchange links because they could get scammed by penalized sites and be more likely to be outed by the legitimate sites. The Penguin algorithm could have increased confidence scoring and become ready for real-time implementation. Again, if I were Google, the next generation of Penguin would likely heavily weight irrelevantly placed links, and not just commercial keyword-specific anchor text. Testing this first on the sites I think are guilty of providing the links and simply devaluing those links seems much smarter. Of course, at this point, there is no specific evidence to indicate Google’s intention behind the unnatural outbound links penalties were intended as a final testing phase for Penguin and to further devalue the manipulated link market. But if I were Google, that’s exactly what I would be doing. 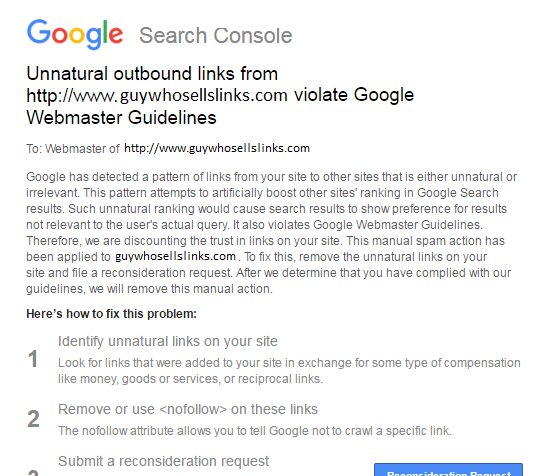 Google’s webmaster guidelines show link schemes are interpreted by intent. I wonder what happens if I start nofollowing links from my site for the intent of devaluing a site’s rankings? The intent is manipulation. Am I at risk of being considered a participant in link schemes? If I do link building as part of an SEO campaign, am I inherently conducting a link scheme? So, since I’m an SEO, not Google, I have to ask myself and my colleagues, “What does this do to change or reinforce my SEO efforts?” I immediately think back to a Whiteboard Friday from a few years ago that discusses the Rules of Link Building. In conclusion, as SEOs, we are responsible for predicting the future of our industry. We do not simply act in the present. Google does not wish for its results to be gamed and have departments full of data scientists dedicated to building algorithms to identify and devalue manipulative practices. If you are incapable of legitimately building links, then you must mimic legitimate links in all aspects (or consider a new career). Most importantly, any links that we try to build must provide value. If a URL links to a landing page that is not contextually relevant to its source page, then this irrelevant link is likely to be flagged and devalued. Remember, Google can do topical analysis, too. In link cleanup mode or Penguin recovery, we’ve typically approached unnatural links as being obvious when they have a commercial keyword (e.g. “insurance quotes”) because links more naturally occur with the URL, brand, or navigational labels as anchor text. It would also be safe to assume that natural links tend to occur in content about the destination the link offers and that link relevance should be considered. Finally, we should continue to identify and present clients with methods for naturally building authority by providing value in what they offer and working to build real relationships and brand advocates.